Musicking’s mission is to stimulate student and community interest in early music and historical performance practice studies by offering five days of academic scholarship, educational performance classes, and a variety of performances that are free and open to all students and community members. This conference is inspired, organized, and facilitated by University of Oregon historical performance practice faculty and students, who are enthusiastic about sharing their passion with other students and community members outside of their intimate early music cohort, providing them with more opportunities to engage in historical performance practice and early music studies. During last year’s Musicking Conference, we were joined by distinguished guest artist, William Dongois, who lead Eugene audiences through various aspects of historically informed improvisation, ornamentation, and variation. It was a treasure for students and community members alike to hear his extraordinary playing, and to learn from him as he shared with us improvisation techniques and studies that have served him well throughout his extensive performance and teaching career. 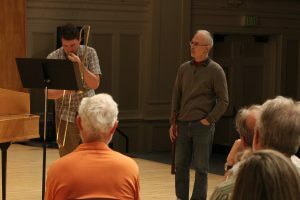 His presence in Eugene delighted audiences, and inspired students to dive deeper into early music treatises, as they continually strive to bridge the gaps between early music scholarship and performance. In our 2018 season, we are delighted to move forward with our third annual conference. This year, we broaden our Musicking lens and explore how music and musicking exist within all aspects of cultures, past and present. In the spirit of our Musicking mission, we look forward to exploring new ideas, challenging accepted conventions, and enjoying the totality of music scholarship, performance, and education under our new theme, Musicking: Cultural Considerations.